Another weekend, another FoF game. This time we played the fourth scenario from the Primer, counter attack. German Waffen SS (Q10, M10) must kill 60% US forces (Q8, M8) defending a bridge, to win the day. We both decided not to use the infantry trucks included in the scenario as no one would be so crazy to go in them into battle anyway. Remember to click on pics for bigger view. Germans counted with two Stugs III, one Tiger I and an asset card which turned to be one Light Artillery round every turn (this card was very unbalancing as it killed two full fire teams in two rounds). US forces counted with two Shermans and one asset card which was Air Strike. US infantry dug in and tanks hull down. The game only lasted two turns as at the beginning of the third turn there was only four US soldiers and one Sherman immobilized that had heroically resisted many shots from the Tiger and Stugs combined with panzerfausts shooting from a very looong distance. The crew resisted all the morale and bail out tests and even force the Tiger crew to bail out! Although the battle only lasted two turns it took us three hours to play it as the game involved too many dice rolling with the rounds of fire and the opposed rolls for everything. I'm afraid the game tends to slow down with so many troops. Sherman and bazookas were no match for the German armour, mainly because my opponent insisted on rolling nines and tens which I couldn't defend with my D8s, and also because I kept rolling under four during all the game. US forces totally exterminated at the start of 3rd turn. I miss a bit more chrome or granularity in the game as infantry weapons and tanks are too much similar among them. I understand and agree with the philosophy of the game to put more emphasis on the quality of the soldiers than on the weapons they are using but even so, I still do not like panzerfausts being exactly equal to panzerschreks, or Tigers practically equal to Panthers, or all the Panzers IV or Shermans being the same thing, etc. Although the game mechanic is innovative in the sense of not using the IGOUGO activation, I still prefer Nuts! to FoF for smaller scenarios as it is much more fluid IMHO. For larger action I'd incline for BKC for the same reason. I think I'll let FoF rest until an expansion specific for WWII is released; then I'll give it a new opportunity as I think it a good system anyway. Force on Force from Ambush Alley. Short AAR and thoughts. Me and a buddy played in his house the scenario "White Christmas", in Ardennes on 23 December 1.944. Germans had to occupy the hill defended by US troops hidden in foxholes (we used crystal beads to mark them). He put his scenery and I brought my soldiers and tanks, all of them 1/72 plastics. We rolled for reinforcements and the German player was to received two Stug III Aus.G on turn 2 and the US player two M4A3(75)w on turn 8. Regretfully the US tanks never came into play as the game was interrupted on turn 6 after three hours of playing as I had to leave to pick up wife and kids. The game uses D6, D8, D10 & D12 dice and many more characteristics that you can see in Stargrunt II from GZG (actually we used its markers for our FoF games), but it has some new concepts that make it a totally new and different game; the most important being the quality dice, the defensive actions & aggressor reactions and the round of fire. These three concepts make the game tactically challenging as well as easy and fluid play. Bearing in mind that we only have played two games so far and that we can be wrong, I dare to say that Force on Force is an interesting game and we certainly will be trying it again, although we didn't like very much the concept of opposed rolls when firing. In our first game we felt that German LMG teams were a bit weak when facing normal infantry, mainly for two reasons: a LMG team has a firepower of 3 (men) +2 (support weapon) +2 (team) = 7 dice, whereas a squad of six men would have 6 (men) + 1 (light support weapon) = 7 dice, the same firepower than a LMG team. Besides, when taking casualties a squad could take up to 6 whereas the LMG team only three. We have always had the feeling that MGs are more powerful and dreadful than they are in this game, and as a quick solution we decided to merge them into infantry squads, so they would have more fire power and endurance, though we didn't like much the idea as we envision them more as small independents support teams than any other thing. Germans taking the left of the hill with Stugs advancing in the middle, on the last turn we played. Thus, by integrating LMGs in normal infantry teams we also discovered the importance of having many dice to roll. Now a squad had the maximum firepower allowed in the game (CAP 10) and as the firing is done with opposed rolls it wasn't so important who fired at it or who fired first, due to the big quantity of soldiers to soak up casualties and to fire. As an example: a German squad was made of two sections integrated into one squad; 1st team with 1 assistant squad leader w/MP40 SMG plus 4 riflemen w/mauser 98k rifles, and an LMG team with 1 squad leader w/MP40 SMG plus 1 gunner w/MG42 LMG (light support) and 2 assistant gunners w/mauser 98k rifles. All this for a total firepower of 11 dice, 14 if in optimum range and counting the double dice of SMGs at such distance, and a total of 9 men. This means that when confronted to a 5-6 enemy infantry men team or a three MMG team, they would devastate them either shooting before or after because of such difference in numbers. Moreover, as the game doesn't give any bonuses for outflanking enemy, shooting at his back or cross firing, we saw that the best tactic was just making big squads and forgot about manoeuvring and flanking as in the end it was almost a matter of just rolling dice. Something that we didn't liked neither was the initiative check. There are a lot of modifiers to check the initiative (something that must be done at the beginning of every turn) but the plain truth is that once a side grab the initiative it's rare he loses it as he has a + 1 die for possessing initiative on last turn and also keeps it in the case the check is a draw. Last thing to say is that we missed in the rule set some things regarding WWII, and that our feeling is that FoF was written with modern combat in mind and that WWII was added in the last moment. Recently somebody asked me about the different sizes of Copplestone's, GW and Pendraken 10 mm. fantasy figures so I've put a picture to show him. IMO, the three brands mix rather well excepting perhaps Pendraken as they are almost a head taller than the other two. As usual click on the pics for a bigger view. 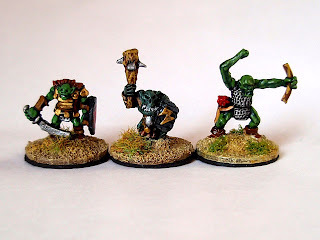 Orcs: Copplestone's, GW and Pendraken. Humans: Copplestone's, GW and two of Pendraken though the human belongs to a historic range which are smaller than the fantasy one. Dwarfs: Only Copplestone's and GW, two of each.